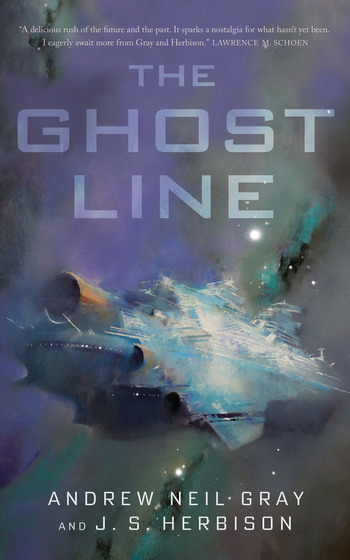 The Ghost Line is a haunting science fiction story about the Titanic of the stars by debut authors Andrew Neil Gray and J. S. Herbison that Lawrence M. Schoen calls "a delicious rush of the future and the past." The Martian Queen was the Titanic of the stars before it was decommissioned, set to drift back and forth between Earth and Mars on the off-chance that reclaiming it ever became profitable for the owners. For Saga and her husband Michel the cruise ship represents a massive payday. Hacking and stealing the ship could earn them enough to settle down, have children, and pay for the treatments to save Saga’s mother’s life. ANDREW NEIL GRAY and J. S. HERBISON are partners in life as well as in writing. The Ghost Line is their first fiction collaboration, but won’t be their last. They have also collaborated in the creation of two humans and preside over a small empire of chickens, raspberries and dandelions on Canada’s West Coast.